Ramon Trias Fargas, 25-27, Barcelona. The explosion in connected devices and the consequent massive amount of data to be analyzed has made it imperative for companies to quickly adapt their products and services. “Maths for Industry 4.0” will showcase how academic excellence at BGSMath is helping companies becoming digital. Join us to learn about successful collaborative initiatives, such as industrial doctoral theses, as well as the range of expertise you could benefit from. The workshop will be closed by a round table on Data Analytics. Our experts will discuss common challenges and trends across sectors, and how mathematical creativity enable solutions for supply chain, risk management, control and monitoring. This activity belongs to the Mobile Week Barcelona and it’s an open space for reflexion on digital transformation through art, science and technology. REGISTRATIONS NOW CLOSED. For any info, please contact communications@bgsmath.cat. REGISTRATION NOW CLOSED. Contact communication@bgsmath.cat for any info. 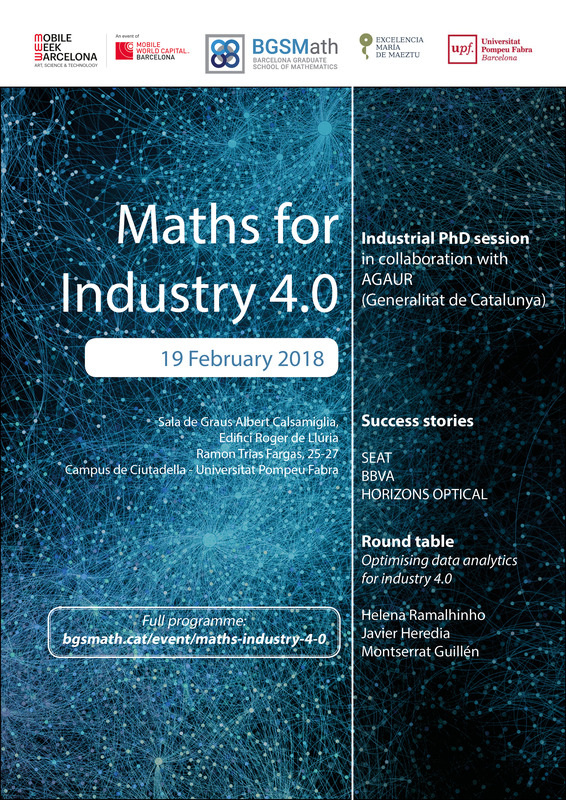 Jordi Alba Granados (AGAUR – Generalitat de Catalunya): Industrial Docs – Supporting Maths for industry 4.0.